Every so often, there is still an occasional crafty venture here at Chez Obsession, and today I thought I'd see if I could scrounge a few of the current projects together. ...which were my train knitting for a while, are going sloooooowly. 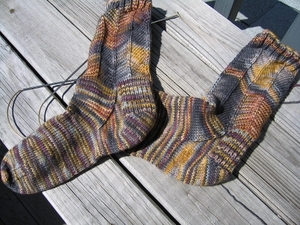 But they're getting there, just a few more rounds to the toe decreases on sock #2 and then BAM, new socks. 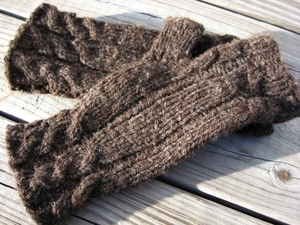 The first new handknit socks in well over a year, I think. I did finish these earlier this year, and have an inordinate love for them. Heh. Maybe for NEXT winter. Wow, those Dashings are really coming along, aren't they? ;) Love how the legs of the socks turned out. Those socks are really cute. It won't take long before you have a new pair of socks. Better get started on those Dashings! Heehee. Nice new knits! 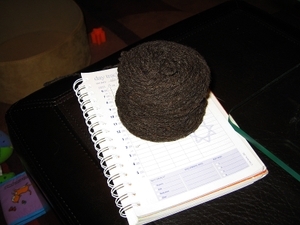 Gorgeous handspun. I LOVE your progress report on the Dashings. That is SO Kellee. Roy looks quite fine.